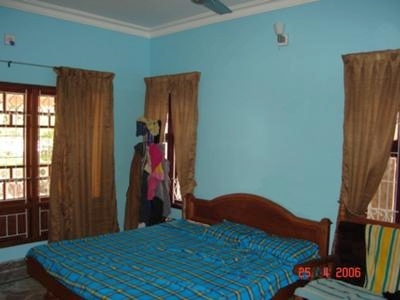 I chose this bright blue wall paint colour for my bedroom for a couple of reasons. First, blue makes the room feel fresher and cooler. Second, it creates a calm and peaceful mood. What more can I ask for after a day of work! I was deeply involved in the construction of my residence from day one. Aesthetically, painting is the most important finishing work. All the discrepancies that happened during masonry, electrical or plastering work have to be rectified at the painting stage. There is no finishing after that! So first, I had all the walls and ceiling puttied. Good quality interior putty always gives a smoother, silkier touch to the finishing. A coat of cement primer was then applied over this wall putty. This cement primer was necessary to help reduce the growth of fungus. Two coats of plastic emulsion over the cement primer made the finish look gorgeous. I used JK wall putty and Asian Paints cement primer. The finishing was done with Asian Paints Royal plastic emulsion. I have heard different ones talk about the Asian paint, but I had never seen it on walls. I think this looks great. It is a calming color.